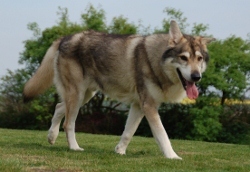 Tamaskan Dog Register Forum • View topic - Intro to the big wolf pack! Intro to the big wolf pack! I do want a breeding pair of as close to the same age as each other so the training can coincide, I am ready for the new additions! Re: Intro to the big wolf pack! Hi. Not sure what you mean by 2 pure blood wolf grey. We dont sell to breeding homes only pets for families. all about the breed before embarking on a second.